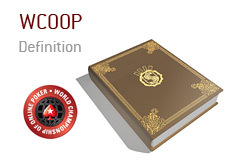 What does "WCOOP" mean? When did the "WCOOP" start? WCOOP stands for World Championship of Online Poker, which is one of the series of poker tournaments that is run by Pokerstars.com. In case you didn't know (and I'm sure that you already do), Pokerstars is the largest online poker site in the world. The first WCOOP was held in July of 2002. Nine events comprised the series, with the main event (which was won by "MultiMarine") ending up with a total of 238 entrants. Fast forward to 2010. The 2010 WCOOP featured a total of 62 events and $50 million in total guarantees. The main event, which was won by POTTERPOKER, had a total prize pool of more than $12,200,000. The WCOOP features all types of different games, from No Limit Hold'em to Pot Limit Omaha to Stud to HORSE to Pot Limit Omaha Hi/Lo. The WCOOP has truly become an "event", with many players specifically tailoring their schedules so they don't miss out.